There’s no use denying the thrill of giving and receiving a weighty box of music as a holiday gift. That’s why so many record companies release their most alluring collector’s sets and deluxe reissues for the fourth quarter of the year. So as you set out to do a little Black Friday shopping or are gearing up to engage in some Cyber Monday e-commerce, here are some suggestions of new boxed sets and deluxe reissues that are sure to delight the music lover in your life. Released 50 years ago, Sgt. Pepper’s remains one of the crowning achievements of the pop music world with The Beatles and producer George Martin heading toward the peak of their creative energies. If any album deserves the deluxe treatment, it’s this one. You have plenty of options for purchasing this new edition, and thanks to the positively awe-inspiring work by Giles Martin and Sam Okell in remastering and remixing the album, every one is worth the expense. (Read our review of this reissue.) For the super fans, spring for the Super Deluxe Edition release which boasts the remastered album, three CDs of studio outtakes and alternate versions of the Sgt. Pepper’s tracks, recreations of the inserts that came with the original 1967 LP, a hardcover book that explores the history and impact of the record along with copious notes on the sessions and a Blu-ray with promotional films and a 5.1 surround sound mix of the album. 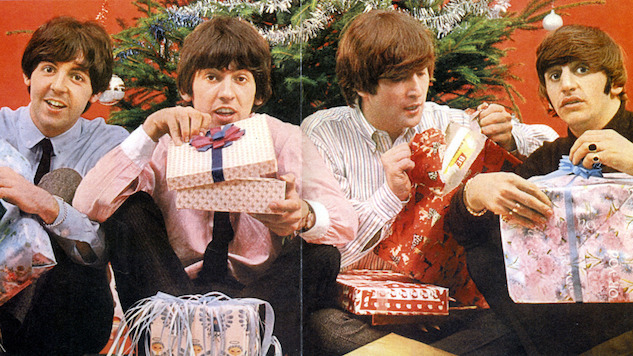 Some of the most oft-bootlegged bits of Beatles arcana are the fan club only flexidiscs that the group would record and mail out every Christmas. At long last, they are finally getting a proper reissue in a cute little boxed set that will be released on December 15th. The limited-edition set puts those discs on colored vinyl 7”s together along with a 16-page booklet that features production notes and reproductions of the National Newsletters the band would mail to its fan club members in December. Bob Dylan’s ongoing reissue series finally lands on one of his most fascinating and polarizing periods: the stretch in the late ‘70s/early ‘80s when he became born again and turned his music into a platform for proselytizing. This new set pulls together live performances from that era, when Dylan was being joined on stage by gospel-trained backup singers and a crack backing band that included, at times, Carlos Santana, Spooner Oldham and Al Kooper. For your gift-giving purposes, you can choose between a simple two-CD set of material or an impressive nine-disc version that features a wealth of unreleased material and two live shows captured in London and Toronto. Bear Family Records has long been known for their extensive and sometimes overwhelming compendiums of rockabilly, country, blues and jazz. But this hefty set is something else entirely. Spread over 20 CDs, this collection dips into the history of Louisiana Hayride, one of the longest-running radio shows in the U.S., which launched the careers of a murderer’s row of country, bluegrass and early rock talent. Though this box only skims the surface of the show’s full history, you still get an extensive look at the first blushes of fame for Elvis Presley, Kitty Wells, Johnny Mathis, June Carter and Hank Williams. To honor the 50th anniversary of the death of Woody Guthrie (October 3, 1967), Bear Family is issuing an impressive three-CD set that brings together the complete recordings of two tribute concerts held in 1968 and 1970 to celebrate the life and work of the singer/songwriter. It’s a beautiful piece of work that comes with two hardcover books: one featuring an index of the songs performed at these two shows, the other bursting with press clippings, essays and photos. Even better is the music, with Guthrie’s acolytes and contemporaries like Bob Dylan, Pete Seeger, Odetta and Judy Collins giving their all to these American folk anthems. Considering the fact that there’s likely a copy of the Saturday Night Fever soundtrack sitting in the dollar bin of your local record shop, the need to own a fancy reissue might not make a lot of sense. But give credit where its due to the folks at Universal Music/Capitol for pulling out all the stops with this set. The Super Deluxe Edition comes with a copy of the soundtrack on vinyl and CD, a Blu-ray of the original film and copious treats like a Saturday Night Fever turntable slip mat, a booklet with essays from Barry Gibb and director John Badham and reproduction of the original movie poster. It’s enough to give a person a full-blown case of night fever. The life and musical legacy of Chris Bell, one of the founding members of Big Star, has been explored in print, in film and through a variety of archival releases over the years. This set, though, as its name should indicate, is the most all-encompassing. The six LP collection brings together all of Bell’s existing pre-Big Star work as well as an expanded edition of his lone solo album I Am The Cosmos. If that weren’t enticing enough, the last disc features a rare interview with Bell, recorded in London in 1975. As writer Jeff Weiss puts it in the liner notes for the anniversary reissue of this hip-hop classic, the first Pharcyde album was the result of a kind of “amiable madness” that helped create such off-kilter, instantly relatable and insanely funky classics as “Othafish” and “Passin’ Me By.” To celebrate its 25 years on this planet, Craft Recordings is issuing a remastered edition of the LP, available in bare bones form on vinyl and cassette, a double CD version with a bonus disc of rarities or a five-disc vinyl version with the original album and recreations of the three 12” singles pulled from it. Anthology Recordings, an offshoot of Mexican Summer Records, has been bringing the fire this year, with their reissue of an album by little-known country/folk artist F.J. McMahon and Paul Major’s finely curated collection of outsider artists and rare psych sides. With the re-release of these three Pharoah Sanders records, though, they’ve truly outdone themselves. These selections come from the tenor sax player’s fertile period on Impulse! Records in the ‘60s when he found the spiritual possibilities in free jazz and post-bop. You can snap up each of these individually or, if you hurry, grab a limited edition box that packages them all together.